Rome is a never ending source of history. Just few days ago, for instance, no less than 80 meters Aurelian Walls were uncovered a little bit below the current ground level in a very central area of the city, i.e. St. John Lateran’s Archbasilica (San Giovanni metro stop). Not that any archaeologists were effectively searching for them. To say the truth, in fact, scholars used to take it for granted (until now) that this section of the Walls had gone lost centuries ago. No records of it was indeed reported in scientific literature, and the square’s radical rearrangements occurred during the 18th century to renovate St. John’s basilica facade seemed enough to believe in the Walls destruction. The unexpected surprise from the earth came on the occasion of the excavation works which have been taking place in a few spots of the city to build future third undergound line (namely, line C). It’s not just about few standing bricks: eleven arches, two towers, and even traces of medieval painting (as those walls served as shelters to hermits during the Middle Age), plus a complex hydraulic system of the modern era (17th century) and slits for archers with visible amendments after the invention of gunpowder were perfectly in place. Such a good concervation status is certainly due to the fact that the earth isolated and protected them from air pollution and other risks. 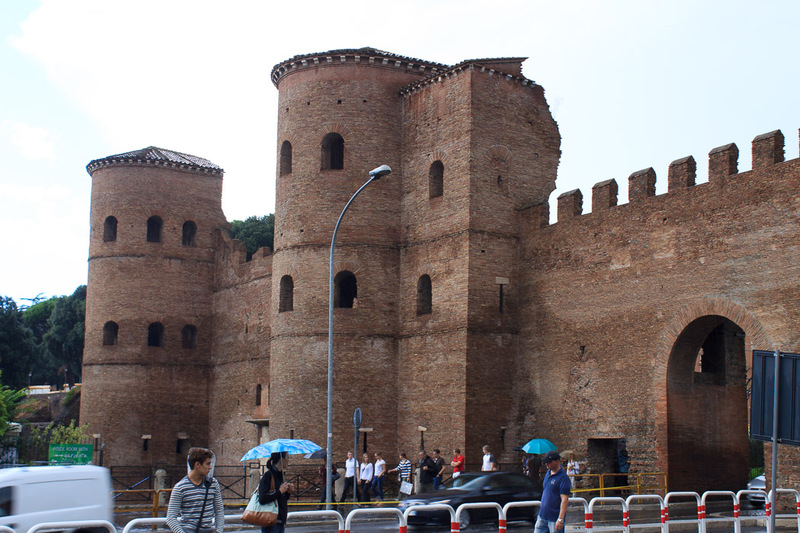 At present, the destinity of this “brand new” section of the Aurelian Walls (which were built in the 3rd cent. AD, many sections of which are fully visible all around the city) seems to become a huge open walkway for visitors, developing a route between this stretch of the Walls and that at the Santa Croce in Gerusalemme’s Church. Ask our staff at Hostel Des Artistes for more info on the Museum of the Walls already open to public!